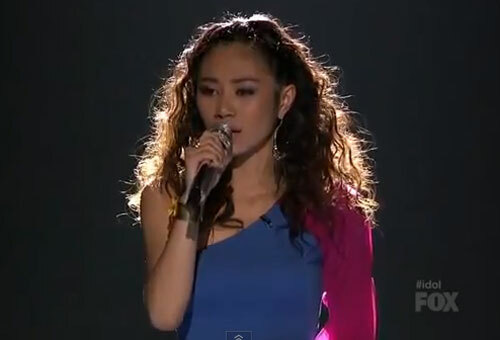 The Fil-Mexican American Jessica Sanchez is now part of the hit US TV show "American Idol Season 11" Top 3 finalist. She matched the success of Filipino-American Jasmine Trias, who also being part of the American Idol Season 3 Top 3. Jessica Sanchez will go home in the city of San Diego as part of the tradition for the show's Top 3 finalist. While Hollie Cavanagh is the one who was eliminated on Thursday's results episode. Sanchez performed Jennifer Holliday's song "And I’m Telling You I’m Not Going" on that night (Friday Morning local time). Watch below the video performance of Jessica Sanchez to the song "And I’m Telling You I’m Not Going"
Meanwhile, The "idol" final two will be announced next Thursday. Comments or suggestions about "Jessica Sanchez made it to the Idol Top 3" is important to us, you may share it by using the comment box below.